While there are many great card shows around the country, the National bests them all as the key event on the card collecting calendar each year. Many thousands descend upon the annual event location with collectors visiting from all over to support the hobby they love. 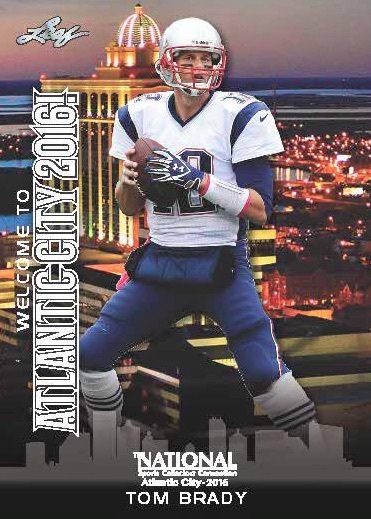 Based out of Atlantic City, the 2016 National Sports Collectors Convention marks the 37th edition of the event. Highlights include hundreds of card dealers selling nearly any collectible imaginable, top athletes signing autographs and plenty of exclusive cards. Beyond the obvious collecting aspect, there is also a tight-knit group of collectors that use the NSCC as a great way to catch up with fellow members in the hobby. For many, this is the top draw for attending each year and it offers another element to the collecting experience. The 2015 event was held in Chicago and future NSCC locations include Chicago (2017), Cleveland (2018) and Chicago (2019). If this is your first time attending, be sure to check out our National Sports Collectors Convention Survival Guide for tips and ideas on what to expect. Where is it? : Atlantic City Convention Center in Atlantic City, New Jersey. Full directions and parking info here. The map below highlights the specific location as well as nearby hotels and other notable options for the 2016 National Sports Collectors Convention in one handy option. In addition to basic admission by the day, visitors can obtain various VIP packages that each offer different perks as well as the ability to attend every day of the convention. VIP packages also provide 12 to 18 free autographs from a pool of VIP signers. Perhaps most intriguing, the All Access VIP and All Access Super VIP grants collectors front-of-the-line privileges for autograph guests. Super VIP tickets also include parking passes. While kids can get overshadowed in today's collecting world, the NSCC continues the tradition of allowing free admission to children that are 12 and under. 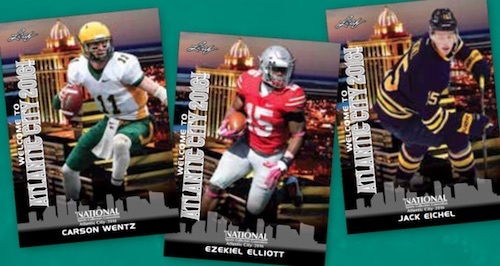 Some might be aware that Atlantic City is also known for other things than just being the host of the 2016 National Sports Collectors Convention. Key options include several casinos and the famed Atlantic City Boardwalk. Once again being handled by TriStar, the Autograph Pavilion is one of the highlights of the 2016 National Sports Collectors Convention each year. While some of the tickets packages do include autographs for select signers, most athletes cost extra. Below is the list of signers planned for the event. Signers and times are subject to change. For full information, prices, signing times, and ticket pre-sales, check out TriStar's website. Some signers appear multiple days. VIP guests are noted below with an asterisk * and free signers (F) are also noted. Full 2016 National Sports Collectors Convention details will be added as they are announced. Most of the major card companies produce special sets for the event. Offering several different card exclusives, Topps will again feature a wrapper redemption at their booth (#1640) along with other giveaways and events. Rocky Balboa is featured in an exclusive ten-card set. Limited four-card packs of 2016 Bowman National Refractors can be earned by opening select hobby packs at the booth. VIP ticket holders will also receive a free four-card pack of 1951 Topps Red & Blue Backs 65th Anniversary cards that celebrate the players from the original set. Topps will host the VIP party to begin the 2016 National on August 3. The event will include free autographs from Eddie Giacomin (NHL Hall of Fame goalie), Mitch Williams (Phillies closer), Roy White (New York Yankees outfielder) and Art Shamsky (Cincinnati Reds / NY Mets). In addition to their popular wrapper redemption program, collectors have another Panini cardboard option with a six-card set only available via a coupon included in the VIP ticket packages. 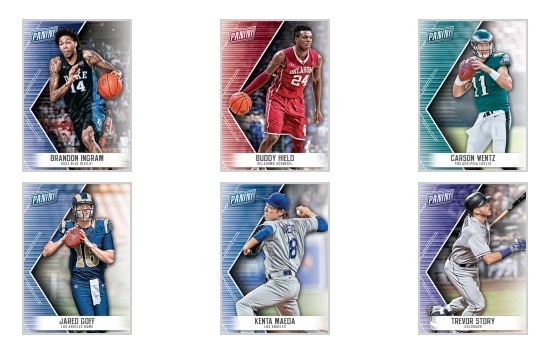 Centering on the top rookie stars across several sports, the full 2016 Panini National Sports Collectors Convention VIP set includes Buddy Hield and Brandon Ingram for basketball, Carson Wentz and Jared Goff for football, and Kenta Maeda and Trevor Story for baseball. As in past years, Upper Deck will issue exclusive cards for the National, including VIP options and Wrapper Redemption packs. For the main wrapper redemption, the Prominent Cuts set will include ten base cards from several different sports, along with autographs and cut signature cards (1/1). 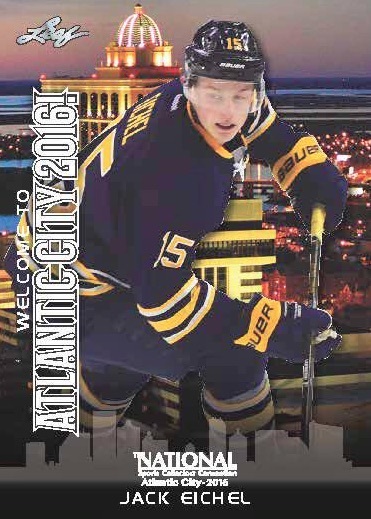 There will also be Top Shelf inserts for ten NHL rookies with limited signed parallels. View full details and a checklist for the 2016 Upper Deck National Sports Collectors Convention Wrapper Redemption set. In addition, 2016 NSCC VIP ticket holders will receive a Prominent Cuts set featuring the biggest names in the UD stable. 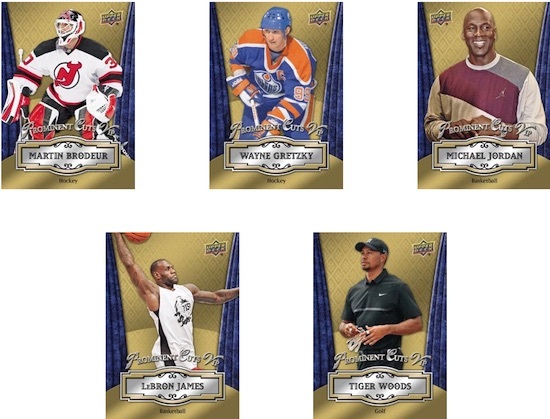 This five-card set includes Michael Jordan, LeBron James, Tiger Woods, Wayne Gretzky and Martin Brodeur. 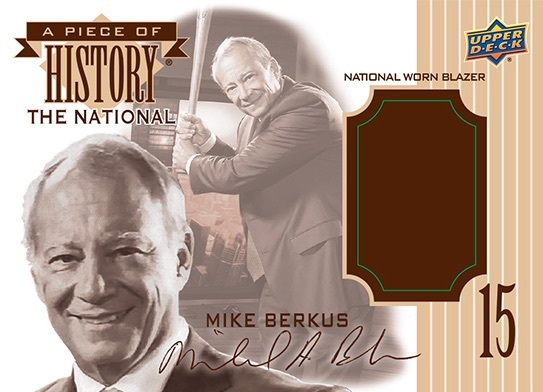 Upper Deck also created a special "A Piece of History" card for the late co-founder of the National, Mike Berkus. The cards mimic the legendary relic insert design from UD and add a National-worn blazer swatch from Berkus. Cards were issued to his family, as well as an oversized display version, and "to partners at the 2016 National Sports Collectors Convention in Atlantic City this summer." 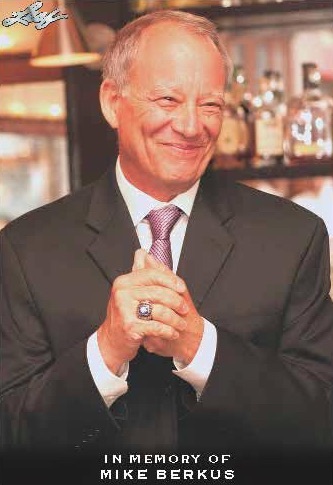 In addition, Leaf will have a four-card set for VIPs that includes an "In Memory of" card for NSCC founder Mike Berkus. 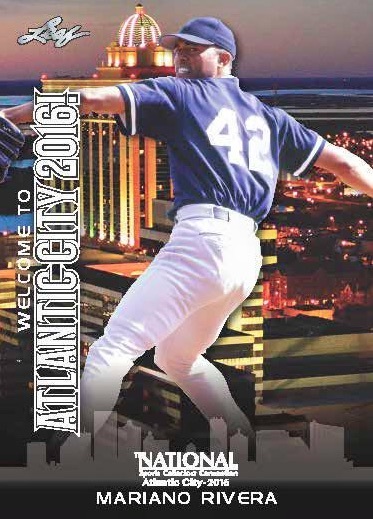 The set features stars of football, hockey and baseball with a Welcome to Atlantic City 2016! headline. Be nice if they would have it in Dallas one year. I have had since 1976 a Phil Esposito hockey stick signed by all the members of the September 1976 Team Canada Cup NHL team. The series was played in Toronto. It has been sitting in a closet since I received at Maple Gardens the night of the Russian\ Canada game. It should be in the hands of someone who would appreciate. I have de same card, Wayne Gretzky O-PEE-CHEE 1979, that someone pay 465 000$US few days ago. My card is on perfect shape in a case since long time. How can a know the approximative value of my card? Thank you and sorry for my english writting.